Sub-aromial impingment is the most common cause of shoulder pain and physiotherapy treatment can greatly assist recovery and is often essential to prevent recurrence. Shoulder impingement occurs when the subacromial space becomes too small to allow easy passage of soft tissue structures during functional activities. This space can be narrowed due to anatomical variants or postural changes. The soft tissues can become swollen (acute phase) and thickened (chronic phase) resulting in further pain and disability. The Australian Physiotherapy Association has published the Shoulder Pain Position Statement which reviews current literature relating to shoulder treatment and rehabilitation. Physiotherapy intervention has been found to be extremely beneficial in the treatment of shoulder problems, particularly subacromial impingement. 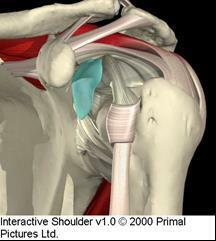 A forward shoulder position increases the tendency for impingement to occur. A forward humeral head can be caused through prolonged poor sitting postures, sporting activities with repetitive overhead movements (swimming, tennis), and stiffening of the thoracic spine can also lead to shoulder protraction as good thoracic extension and side flexion is required to allow the glenohumeral joint to move through full range unrestricted. The patient will present complaining of sharp shoulder pain with overhead activities and reaching for things. They may have difficulty sleeping on that shoulder at night and the shoulder may ache in the evening. The pain is usually experienced at the deltoid insertion, but may also travel closer to the front of the shoulder. If the pain extends into the upper trapezius muscle, then the cervical spine is usually involved. Impingement tests (such as Hawkins and Kennedy) will be positive. Physiotherapy treatment for shoulder impingement in the acute phase includes local electrotherapy to decrease tissue inflammation, and commencement of postural correction to take pressure off the impinged structures. Postural correction will involve thoracic spine mobilisations to improve thoracic ranges, lower trapezius exercises to encourage scapular retraction, stretching and releasing tight anterior structures such as the pectoral muscle groups, stretches for the posterior capsule of the glenohumeral joint (if this is tight the humeral head is forced forwards), stretches for scalenes and levata scapulae muscle groups, and cervical spine treatment (C5/6/7 segments) if indicated (cervical spine pathology can maintain impingement signs due to referral patterns). Strengthening of general shoulder muscle groups, such as the rotator cuff, will also be implemented. A local injection of steroid can significantly improve pain if the condition is not settling with conservative management. However, even if a local steroid injection can temporarily settle the pain of an inflamed subacromial bursa, if the biomechanics that have caused the impingement are not corrected, the pain and disability will return before too long.